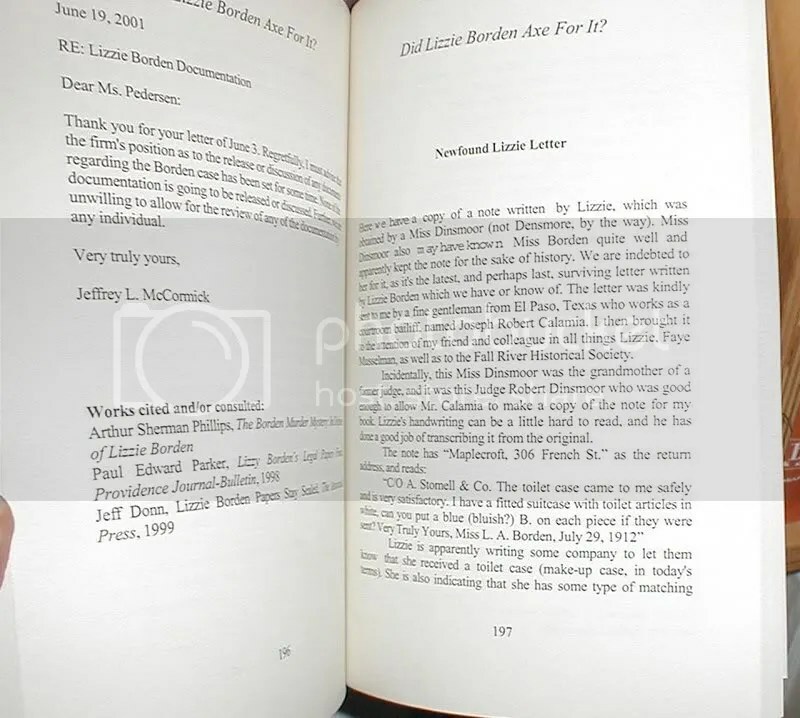 The third and revised printing of David Rehak’s 270 page softcover book, Did Lizzie Borden Axe for It?, contains a never before seen note written in Lizzie’s hand shortly after the sinking of the Titanic. This book is now available (along with Mr. Rehak’s other books) thru Lulu Press as seen by clicking HERE. This is a different kind of Lizzie book. 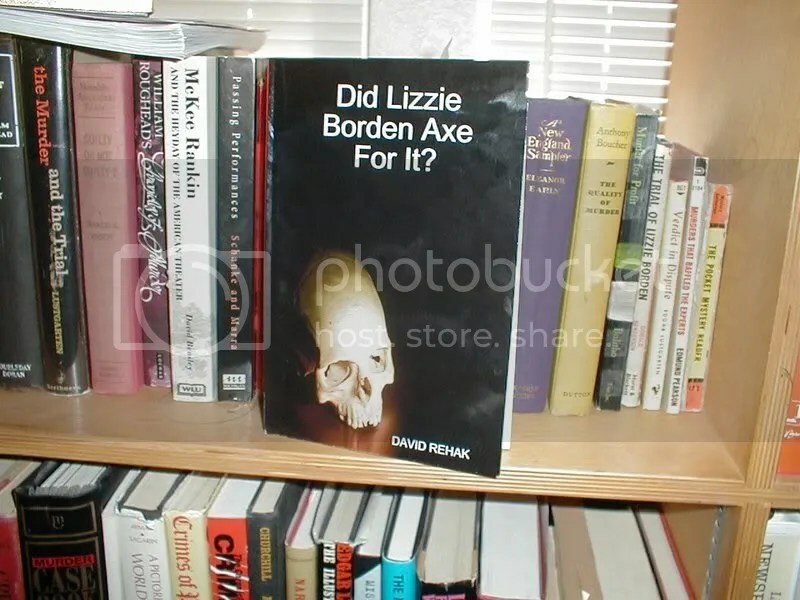 Traditionally, the Lizzie books have a sequential, narrative progression, spilling forth the saga of the murders of Andrew and Abby Borden against the backdrop of Fall River, Massachusetts and peppered with some new (and often outrageous) theory of who dunnit. Not this book. No long, flowing narratives here. No in-depth research filling chapter after chapter. Instead Dave takes us on a thoroughly enjoyable Mr. Toad’s wild ride weaving in and out, up and down, over and around and back again, giving us punches of “in your face” data to quickly absorb, question, and quickly move on. 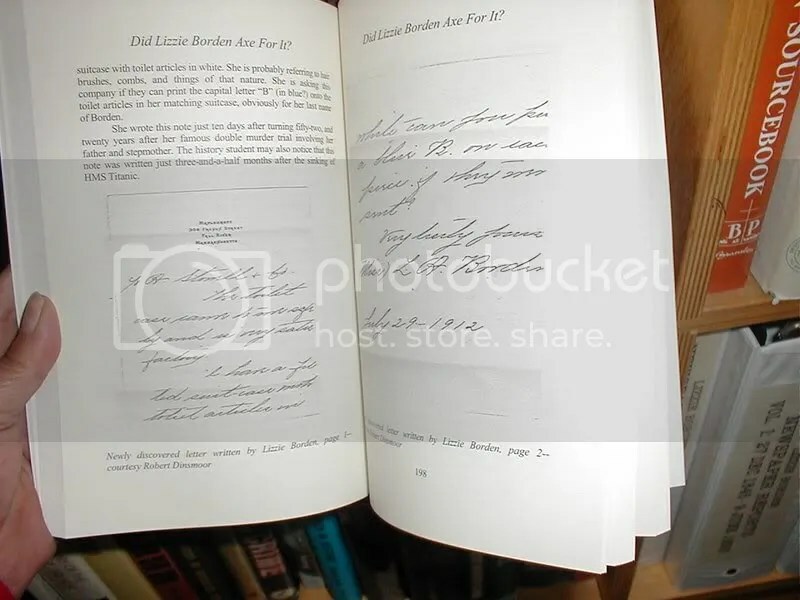 There are two things that have never been published in any book on the Borden case before and they appear in this book only. One is revealed to the public in printed form for the first time. First, this portrait of Andrew J. Borden as a young man – perhaps taken at the time he married Sarah Morse Borden. Neither this image or similar image has appeared in a book up to this time. 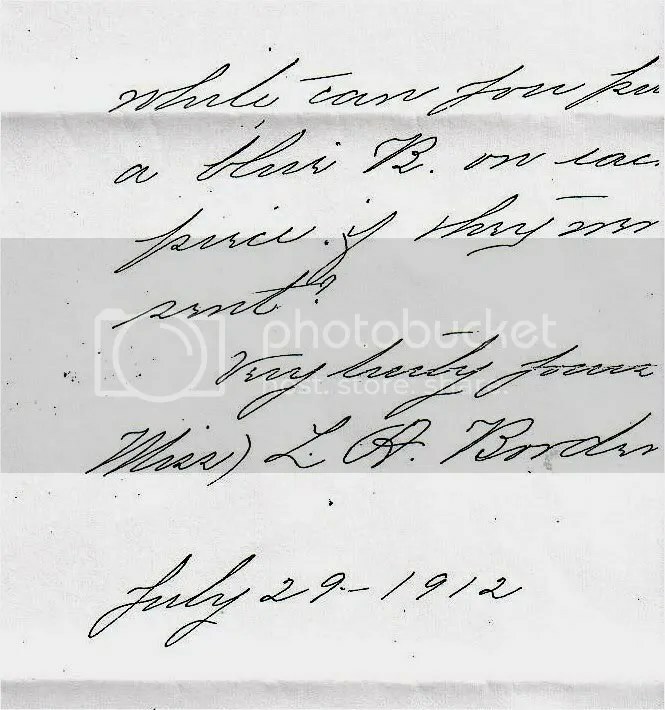 Second, and more importantly, something “new” in Lizzie’s own hand: a note she wrote not long after the sinking of the Titantic wanting the initial “B” placed on toiletry items for her matching case. 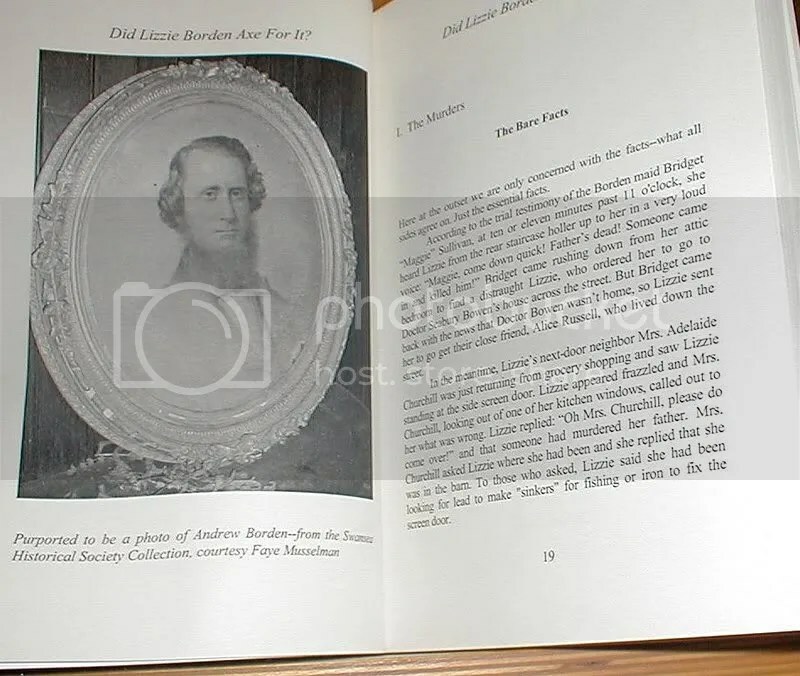 It gives us insight into Lizzie’s own vanity, her keen eye for quality, and maybe even tells us how much that “B” as in B O R D E N meant to her. I have permission from author Dave Rehak to include that note in this blog so here it is as introduced in his book. 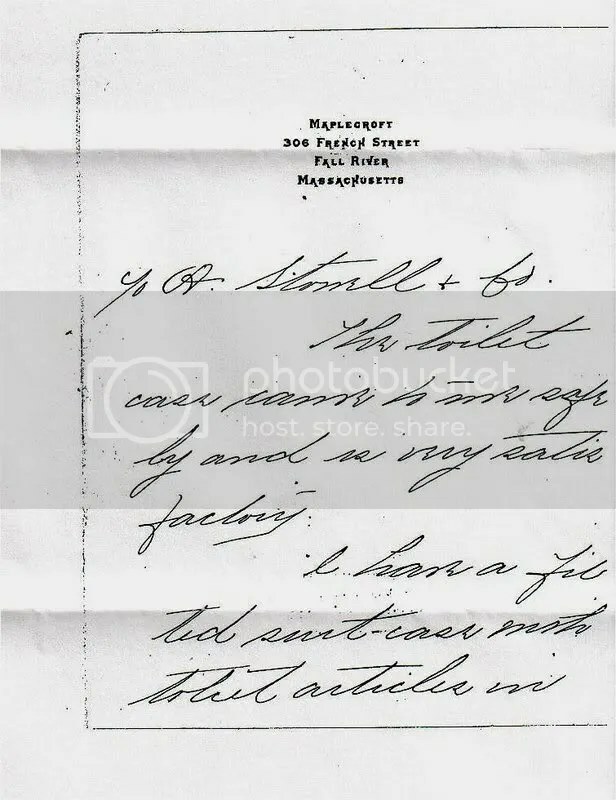 Below are images from my own digital copy of the original note. I wrote about this new edition coming out in a previous blog entry where I explained the facts of why a second edition was “rushed to print.” This third edition has corrected the abysmal editing errors that were an unfortunate result. You can read why this happened HERE. If you have the first edition – hold on to that baby – it’s value just soared! And having a collection of all 3 is what the true Borden collector aspires. Since learning of Lizzie Borden July last year & the great possibility of this being my past life I have made several comparison photos to all the people close to me & close to Lizzie and their are many. I would love to share somewhere but haven’t found someone who is completely open to hearing my story. When you created the post on Edmund Pearson, before I read anything I saw it was my other longest lover that wasn’t Aaron (Seabury). And suprize, Ryan’s Ede’s birthday is the day Edmund died. Also Ryan studied criminal law and his mother had her own website called Mary Ede The Skirt. She sells them for up to $10,000au. My big sister Mwrissa Tones looks like Sarah Anthony Morse & Merissa had a child she named Emma (who looks like Abby) to a man named Andrew ( I cannot identify). My father looks like the chemist Lizzie trued to purchase poison from. (He paid to get me aborted but it failed) And Andrew Borden looks like the drug dealer that Aaron over dosed next to 3 years ago. A old friend of ours for 20 years. I am so much like Lizzie but I have deteriorated in some respects ( I’m not as classy or well read) but have definitely more spiritual values and try to keep everyone safe happy and loved whom are close to me. I left school to work in a kennel and cattery aged 16 just before I met seabury… :). I don’t have any Lizzie books but would love to read the last 2 that you blogged about although I’m not to sure its healthy for me to go to deep into my past. However I can’t stop reading your posts… So interesting. I winder who this David Anthony is? Have you blogged on him?